The Port Gaverne Hotel has scooped the Best Pub in Cornwall at this year’s prestigious National Pub & Bar Awards. And they’ve just heard they’ve been shortlisted for Best Marketing Campaign at the ‘Oscars of the Catering industry’, The Catey Awards. For the past year, the whitewashed, flower-festooned pub nestled in Port Gaverne Cove, a short walk around the headland from Port Isaac on the North Cornish Coast, has been picking up rave reviews from foodies in the know and customers lucky enough to pop in off the beach for the first time. Now it’s official. The reinvigorated kitchen team, headed up by James Lean, formerly with Nathan Outlaw, Angela Hartnett and Gordon Ramsay are catching the eye of some of the pickiest culinary judges around. The National Pub & Bar Awards recognise excellence in the industry and Port Gaverne Hotel has been noted as offering food of exceptional originality and quality, consistently high standards and a warm, welcoming atmosphere. And on May 24th, they’ll learn at the UK finals if they’ve picked up the ultimate prize of National Pub of the Year. The last twelve months have seen The Port Gaverne Hotel receive a string of prestigious awards. 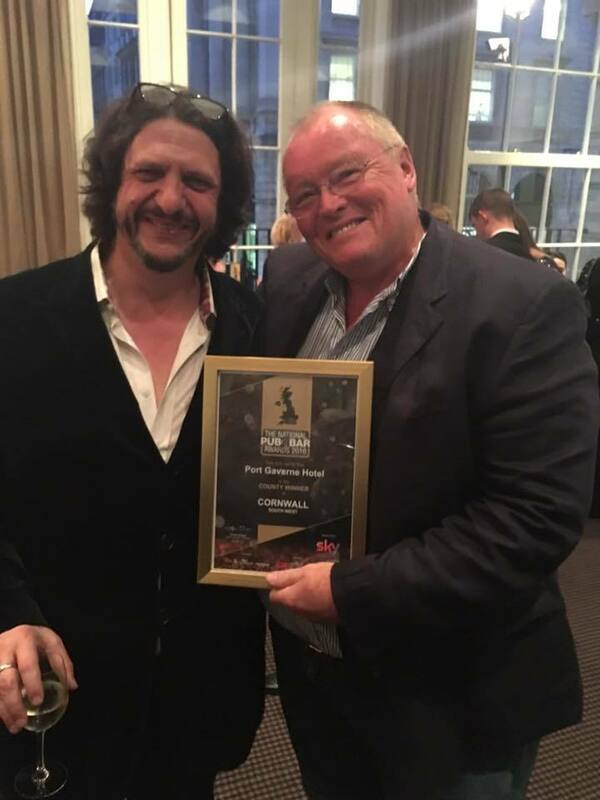 In Autumn 2015 they picked up ‘Best Food Pub in Cornwall’ at the Great British Pub Awards 2015, were ‘Best Newcomer’ runners-up and winners of ‘One to Watch’ at the ultra-competitive UK’s Top 50 Gastropub Awards (judged by Tom Kerridge, Anton Piotrowski, food writers and fellow peers in the industry). They’ve also been shortlisted in the Great Cornish Food Awards for best restaurant and picked up Taste of the West Gold for Dining Pub. Last week, they also found out that they’re in the final three for Best Marketing Campaign at the Catey Awards 2016, which recognise the sector’s strongest performers, latest emerging brands and highest flyers as determined by the industry itself. Up against major players, Pizza Hut and Red’s True Barbecue, it’s a significant achievement for the hotel, and their marketing team, leading Cornish creative agency, Voice Group. The winner will announced at London’s Grosvenor House Hotel on 5th July. Owner David Barnard sees it all as a reflection of the hard work, financial investment and strict no-second-best attitude they’ve built up in the team since taking over in May 2014. But is there a particular secret behind their success? Find out what all the fuss is about – book a table on 01208 880244.